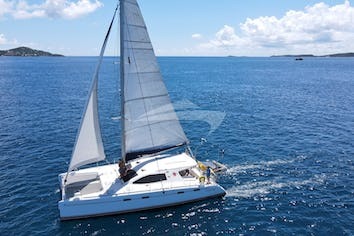 Privilege catamarans are known for their quality, sophisticated and luxurious high-end designs and comfort. XENIA 50 was launched in 2015 and is beautifully decorated and outfitted to the highest standards. She offers three guest cabins each with a queen size berth, private bath with electric fresh water flush toilets, stall shower and vanity. There is plenty of lounge space in the cockpit, salon and top deck. 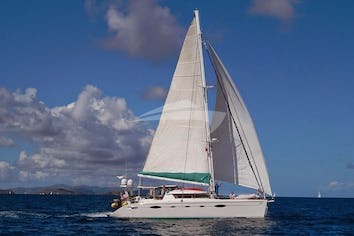 Come sailing with XENIA 50 and enjoy the best of yachting. With Peter and Jade as accompaniment on your XENIA 50 experience, your sojourn will be decidely nothing less than world class. What sets Peter and Jade apart is that—in addition to being highly-skilled crew—they are both also extremely talented gourmet chefs. Having spent years creating culinary delights for the rich and famous (including Hollywood starlets and American presidents) they proffer the true epitome of lavish gourmet dining. Peter applies his classic French training to local exotic ingredients and, as a certified Sommelier, pairs them with the best wines from around the world. Jade's influences stem from her Asian-Pacific upbringing, with emphasis on fresh and healthy meals brimming with delectable originality and sumptuous flavors. With Jade and Peter, your dining is guaranteed to be exquisite—with the very best of gourmet cuisines expertly prepared to ensure every bite is tailored to perfection and catered to the highest possible standard. With superb service and a personalized menu, the mouth-watering cuisine aboard XENIA 50 is an adventure in and of itself. Peter’s ease at the helm and 14 years of management experience ensure only the very smoothest of vessel operations. He literally cut his teeth on his family's Morgan 27 and Morgan 40 on the tempestuous waters of the Great Lakes. Racing several evenings a week and three-day cross-lake marathons are still commonplace in the Lech family, with them consistently placing top of their class and best overall. Sailing is in the Lech blood. 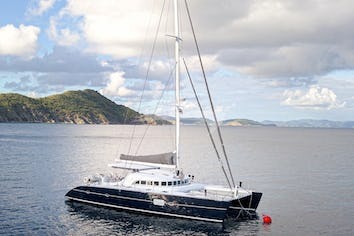 Jade's extensive sailing grounds span the Pacific Coast from Vancouver Island to Costa Rica, the Atlantic shores of New England and the Eastern Caribbean. She has hands-on experience with virtually any kind of sailing vessel—from tuna fishing boats and tall ships to luxury catamarans. Peter and Jade look forward to welcoming you aboard XENIA 50. Words cannot express how very great full we are for all you both did to make this trip truly unforgettable! Every moment was perfect. From the beautiful snorkeling spots, unmatched hospitality, outstanding meals-each crafted with incredible, imaginative components, to the tubing ( go Mr. captain!!) and Paddle boarding- we were able to experience so many “firsts” with our girls that we will never forget!! You two have a fantastic gift to creating a magical time for your guests in which the phrase “ not a care in the world” is truly a reality!! Again manny many thanks. And hoping very much to see you again soon! Next time with little Thomas joining in. Safe travels and good health!! Another Bucket item Accomplished! Will definitely return for a future visit. Peter and Jade made the trip a wonderful one- great food experience as well as bartender skills. Thank you both for a great sail. Thank you for everything and more! Words cannot describe our appreciation of both of you . From the moment we arrived we felt welcomed into your home. Xenia 50 is as beautiful as you are! Your love of food and hospitality goes beyond measure. Simply Amazing! We will see you again soon… we will miss you in the meantime! Thanks so much for the best 80th Birthday I ever had. The entire family, doing their own things appreciate your unfailing indulgence of our pursuits from foils, kites , snorkels, scuba and/or laziness. Jade’s imaginative meals were always a delicious of 10 or more ingredients( making it impossible to copy only photograph) this was the best voyage ever for us and hopefully ok for your too Peter and Cindy Mebel Boston MAGreg and Maria Paia Maui HIJeff and Rebecca Franklin TNTHANK YOU AND FAIR SAILING! We have been looking forward to a vacation on the water for many years. this one exceeded our expectations. A wonderful relaxing, happy trip thanks to you two. David and Robin Philadelphia PA PS the seven fishes was amazing!!! Thank you for a wonderful week! You helped us to relax, celebrate and enjoy our time with you and our friends. We can’t thank you enough for another fantastic vacation! our time with you on the Xenia 50 is a yearly family Highlight that we all love and look forward to. It is a rare thing to have one's expectations so entirely exceeded by the experience. In Don’s case the expectations were modest but he was blown away. In Nicole’s case her expectations were very high- and she was still blown away! A simple sailing adventure became a world of discovery and a gastronomic journey that we believe will not be outdone, at least until we see you next. Thank you ever so much for all of the caring detail. Thank you for the one of a kind experience on this boat. The food was amazing and all the stops we had made were great too! Hope to come back soon and have a great time! Thanks so much Jade and Peter for a amazing trip and the best tacos i’ve ever had along with many other one of a kind meals. The Best sailing trip ever! Not a single disappointment along the way, rather Jade and Peter out did themselves time and again with their amazing sailing , food and customer service. We will be back! xoxo Carol"
Fabulous sailing and each meal a culinary experience! Jade and peter were the perfect host to a beautiful vessel. they anticipated our every wish and were truly a great team. We enjoyed every minute. we will partner again! xoxo the winslows"
We had a wonderfull Time and made fantastic memories. The food was incredible and you were very sweet with the kids. We are sad to leave but hopeful to come back. What a pleasure meeting Peter and Jade Everything was beyond amazing and wonderful! Difficult to put into words how wonderful sailing with Peter and Jade was. We were treated like Kings and Queens, Princesses and Presidents, to the point of feeling guilty. Both exceptional chefs! Xenia 50 & Crew deserve each other! Thanks Jade and Peter for a fabulous vacation! The Boat is amazing and Exceded our expectations crew were top notch fun and full of knowledge! Food was Fantastic and we were pampered the whole week! This is a trip we will never forget and we thank you for helping make this trip a great family vacation! Jade and Peter, Awesome boat... Check! Awesome weather...Check! Awesome food... Check! Awesome scenery...check! Awesome service...check! GREATEST HOSTS ON THE PLANET ...DOUBLE CHECK!! Thank you for a fantastic week, one that we will never forget. looking forward to being back with y'all soon! Once again, thank you very much for the fantastic trip. We wish we had more time. This trip was truly the gem of the fam trip. Nobody was expecting such a beautiful boat, a friendly crew and a superb chef. Personally, the cold soup of avocado and cucumber was my favorite meal in the entire week! The feedback from everybody was spectacular. They were very picky checking how clean Xenia was. Also, highlighted the quality of the amenities, the orchids in the bathroom, the customer service, all snorkel equipments new and the detail of the final and amazing gifts. Once again, many thank you for the amazing day! Thank you again for lunch - which was absolutely outstanding! Thank you both for an excellent lunch, I thoroughly enjoyed it especially the lobster starter. I just wanted to thank you both so much for inviting me for lunch on Saturday. It was absolutely delicious and I was blown away by the flavours of a well-balanced meal. The chicken with preserved lemon was incredible as was the raddish and fennel salad. It was all beautifully presented and the clean plates of all guests said it all! Thank you so much for the hospitality on Xenia last weekend. Susan and I enjoyed lunch very much. Looking at the image below, seems others did as well.